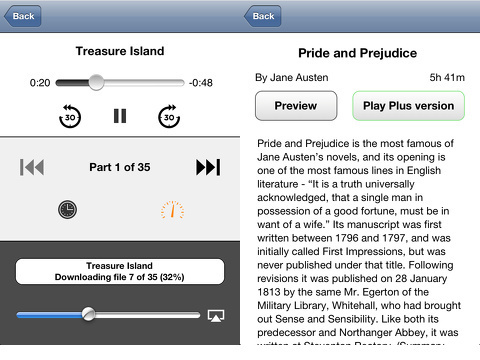 The Audiobooks Premium app from Cross Forward Consulting, LLC for iPhone, iPod Touch and iPad allows anyone to download and listen to 4,382 classic books for the small cost of 99 cents for the app. This app is good for fans of classics or anyone who has lots of waiting time while they travel or during their day-to-day life. The graphics are very bare-boned. There is no exciting color scheme or oak wood shelves with little pictures of novels placed in them. The font is black and the background is either gray or white. There are no fancy graphics as you switch from screen to screen. The app is easy to navigate as all the books, features and settings are categorized logically and available on the main menu page. Books can be either streamed or downloaded, depending on the reader’s preference and WiFi availability. There are a few notable features about this app. What really stood out were the features available while the story is playing. The user can adjust the background lighting to adjust for nighttime, speed up or slow down the narrator’s voice and set a timer to have the story stop in the selected amount of time. All this can be done on the screen from which the story is playing. ‘My Library’ on the main menu screen saves books the listener already or is currently still listening to. The user can also search for books based on the duration of the book reading under the ‘Durations’ category. This allows users with a specific set amount of time to make a story selection based on that. The narrators’ voices were hit or miss. Some narrators had great reading voices, while others were monotone or talked in an awkward way that made it difficult to follow the story. Fortunately, if one finds a narrator they love, they can look for more books read by them in the ‘Narrators’ category on the main menu. The app also has dozens of books available in a wide range of languages. The free library has a great collection of classic books, ranging from the Bible to Kurt Vonnegut to Mark Twain. Classics purists be warned, some of the stories are edited so the listener may not get the full, unabridged story. Newer books are available and can be searched for in the ‘Quick Search’ box or in ‘Genres’. The list of books available to buy is extensive, but not exhaustive. Don’t expect to find The Hunger Games trilogy or 50 Shades of Grey. You will find books from bestselling authors like Jodi Picoult, Charlaine Harris and Jeff Kinney. But, be prepared to pay somewhere around $25.99 for these newer books. 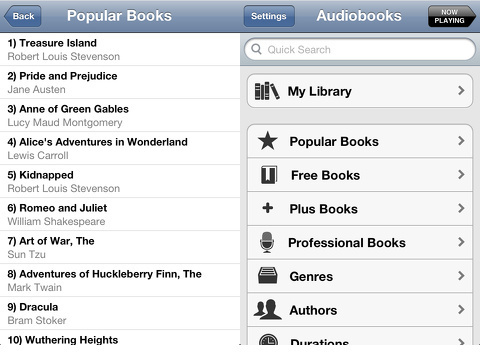 AppSafari review of Audiobooks Premium was written by Sally Pope on July 31st, 2012 and categorized under App Store, Books, iPad apps, Universal. Page viewed 4433 times, 1 so far today. Need help on using these apps? Please read the Help Page.